A recent public opinion poll suggests the majority of Russians do not want excessive competition in the political field and a quarter of the population would be happy to have a single-party system. ­The poll was conducted by the Levada Public Opinion center on April 15-18. It showed that 47 per cent of Russians consider the quantity of two or three political parties as sufficient. Twenty-six per cent of those polled said they would be happy in a single-party state and only 12 per cent said they were for the multi-party political system. Ten per cent of Russians refused to answer the question. While the answers could reflect the real political preferences of the people they could also be a result of the frustration with the current state of democracy mechanisms. During the same poll only 32 per cent of people said they believed that the forthcoming parliamentary election will be fair. Half of those polled said they expected numerous violations and fraud at the election as well as pressure on the voters. Fifty-four per cent of those polled said that the forthcoming election will be a mere imitation of a struggle and in reality the seats in the parliament will be distributed by the authorities. A total of 40 per cent of Russians admitted they were interested in the election while 56 per cent said they were not interested. This is less then the result of the poll conducted four years back, before the previous parliamentary election. Then, 55 per cent of Russians admitted they were interested in the election and the turnout on the day of the poll was 64 per cent. Presently, the conservative United Russia party is holding absolute majority in the Russian parliament with other factions, such as Communists, Liberal Democrats and leftist Fair Russia occupying only minor positions. 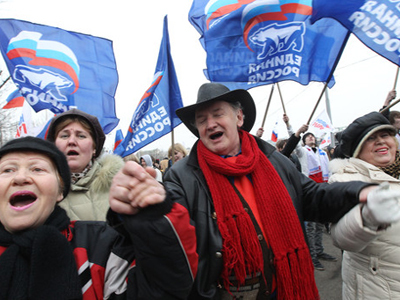 Recent polls, however, have shown that United Russia may lose the constitutional majority at the forthcoming election, albeit retaining the majority of over 50 per cent of the votes – allowing the passing of any bill apart from changes to the Constitution. 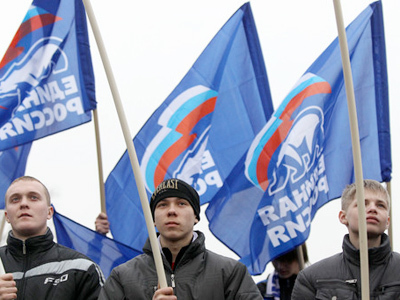 Support from United Russia is therefore crucial for all politicians even though the party is drawing growing criticism as the election nears. 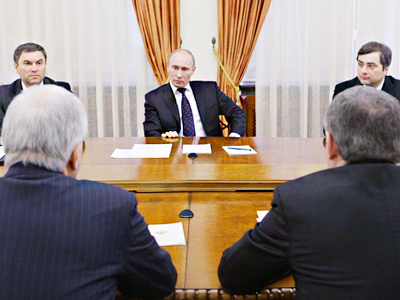 President Dmitry Medvedev held a meeting with United Russia representatives on Thursday at which he said that though it has become a custom to criticize United Russia for bureaucracy, dominance of all sorts of bosses and merely for its size, the party still has a “control stock” in the parliament which is proof that the people trust this very party. 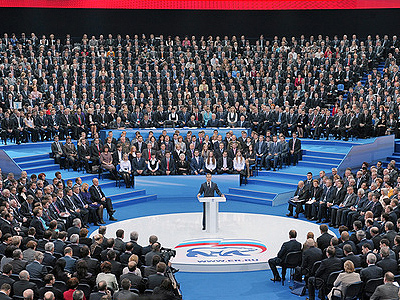 Medvedev also thanked United Russia for its support and expressed hope that it would keep the high standards at the forthcoming election.